Ah F1. Is there anything more exciting than seeing cars of all colours of the rainbow zooming gaily around some of the most exotic locations in the world? One hundred years ago, back when F1 drivers spent more time shovelling coal than having to deal with the myriad switches at 200MPH (the kind that make your anger at there being 'too many buttons' on the new PS4 controller seem redundant), this might have been true. But recently the race organisers have started using a technology known as ‘broadcast television’ to allow F1 fans to watch races from anywhere in the world. Read on for the best places to watch the start of the new F1 season. In the UK, Sky and Channel 4 are sharing broadcasting duties for this season. The first race, the Australian Grand Prix will be broadcast by Sky live on its Sky Sports F1 channel with highlights shown later on Channel 4. Later races will be broadcast live on Channel 4, with highlights shown later on Sky Sports. If you’re a Virgin TV subscriber then you can watch the race on Virgin Channel 508. Programming starts at 4:30am while the race itself begins at 6am GMT on Sunday 26 March. If you’ve got Sky you’ve got a couple of options for how to watch the first race: the crispest way is with a Sky Q subscription which will allow you to watch the race in sharp Ultra HD if you have the correct equipment and subscription. Non-Sky Q Sky subscribers will be limited to HD. If you’re a Sky customer that’s away from your TV, you’ll also be able to watch the race through Sky Go. If you’re not currently a Sky subscriber, then you’ll be able to watch the race through the broadcaster’s streaming service, Now TV. You’ll need to opt for the Sports Pass which is available by the day, week, or month, or you can wait for the Channel 4 highlights at 2PM. In the US NBC has the rights to broadcast the F1, so you’ll need a cable subscription to watch the race. The opening race will be broadcast on NBC Sports Network. Broadcast starts at 1am ET with the race starting at 2am on Sunday 26 March. You’ll also be able to stream the race online live using the NBC Sports Live Extra if you have a cable subscription. 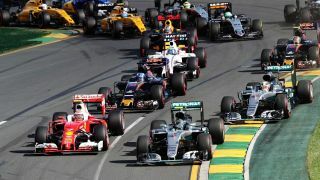 In Australia, broadcaster Ten has the rights to stream the F1. You can find Ten SD on channel 10, or channel 13 for Ten HD. F1 coverage starts at 10am in the morning of Saturday 25 March on both Ten and Ten HD with the race itself starting at 5pm. The race can be streamed using the broadcasters Ten Play service. Check out our full Sky Q review for an outline of the UK service.